In this week’s study from Tehillim / Psalms 65:1-13, the psalm opens saying, א לַמְנַצֵּחַ מִזְמוֹר לְדָוִד שִׁיר: For the choir director. A Psalm of David. A Song. David was a great warrior and mighty king. He won the love of the people of Israel and of the Lord God in heaven. The Book of Psalms is divided into five parts which may be paralleled to the Five Books of Moshe. In Judaism, the Psalms is further subdivided into seven parts, one for each day of the week, and then into 30 divisions corresponding to each day of the month. Orthodox Judaism makes it a habit to say a portion of the Psalms every day after the morning prayers, thus completing all the Psalms in the course of a week or a month. The reason the Psalms are so important, is because David is considered the link in the continued transmission of the Torah, by reason that he was the successor to the prophet Samuel. Rabbinic tradition has it that David surrounded himself with prophets and scholars and together they studied the Torah. During David’s life, he did not consider the comforts of life and the rabbis say, unlike other kings he would rise before the sun to pray and sing psalms of praise to the Lord God in heaven. The Psalms are hymns of praise to the Lord Almighty, Creator of the Universe. They speak of the Lord’s greatness, His goodness and mercy; His power and justice. In addition, we are told in the Psalms that the wicked perish, they dig their own pits, they are destroyed by the words of their mouth, and they spend their lives devising evil deeds, to harm the innocent. David pours out his heart in the Psalms and puts into writing his sincerest and purest trust in the Lord God alone. Many of the Psalms are prayers and supplications to the Lord which David prayed in times of trouble. Other Psalms contain wisdom advising how the righteous should live. David is essentially telling us that the way of true happiness is found through serving the Lord, performing good deeds, and obeying God’s commandments. David’s words remind us of what Paul said, that every mouth may be closed and all the world may become accountable before God. The Torah instructs us how to live holy and righteous lives. The reason being, we are God’s children, and He makes His dwelling place inside of us. Thus, we are to behave in a manner that is suitable for the King of the Universe, the Lord God in heaven and His Messiah Yeshua to dwell. This requires a very high standard of living, and by logic draws us back to a Torah context of God’s promises to dwell in our midst. In addition, living as Yeshua did is what pleases the Lord. The Torah functions as our outward expression of our devotion to Him (the Lord). The greatest commandment is “You shall love the Lord your God with all your soul and with all your mind” (Devarim / Deuteronomy 6:5, Matthew 22:37). According to the Apostle Paul, God’s law has not changed, what he has commanded of us has not changed, we must love Him and by our love for Him, we are also to love one another. Paul said in Romans 3:31 “Do we then overthrow the Torah by this faith? By no means! On the contrary, we uphold the Torah.” Based upon David’s words and Paul’s, every human being is under the law. Romans 2:15 “They show that the Word of the law is written on their hearts, while their conscience also bears witness, and their conflicting thoughts accuse or even excuse them.” As a result, every mouth will be stopped and the world will be accountable to God. No person will be able to say to the Lord that they have been judged unjustly. The Lord is just and true, and has placed the truth in each of our hearts so that we are held accountable. He has done this so that on the great day of judgment, when each one of us stands before the throne of God, none of us will be able to accuse the Lord. Not one person will be able to blame their unbelief on the Lord. Everyone’s mouths will literally be closed and dumbfounded at the realization of our guilt before the Lord. Our mouths will be stopped with the revelation of how much we have wronged the Lord and others. The most significant point of the commands and these truths is that the Torah places the Lord God on the throne of our lives and not us. The Lord is the one who rules and reigns, and when we sin in disobedience, we are to repent and turn from our sin. One day, every mouth will be stopped before the Lord, and this may be the context when David says, 65:1 There will be silence before You, and praise in Zion, O God, And to You the vow will be performed. (NASB) David also says in Tehillim / Psalms 65:2 O You who hear prayer, To You all men come. (NASB) This speaks of the need for us to seek the Lord sooner (right now) rather than waiting for later. David continues saying, ד דִּבְרֵי עֲוֹנֹת גָּבְרוּ מֶנִּי פְּשָׁעֵינוּ אַתָּה תְכַפְּרֵם: ה אַשְׁרֵי | תִּבְחַר וּתְקָרֵב יִשְׁכֹּן חֲצֵרֶיךָ נִשְֹבְּעָה בְּטוֹב בֵּיתֶךָ קְדשׁ הֵיכָלֶךָ: 65:3 Iniquities prevail against me; As for our transgressions, You forgive them. 65:4 How blessed is the one whom You choose and bring near to You To dwell in Your courts. We will be satisfied with the goodness of Your house, Your holy temple. (NASB) David uses the words “avonot” (עֲוֹנֹת) for iniquity, and “peshaenu” (פְּשָׁעֵינוּ) our transgression. Tehillim / Psalms 65:4 (MT) shows us that the Hebrew language contains several words for sin beyond the word “khata” (חטא). The word “pesha” (פשע) refers to sin that is done out of rebelliousness. The word “avonot” (עֲוֹנֹת) plural defective spelling meaning “iniquities,” is a sin performed out of a moral failing. The word that is most commonly translated as “sin” is khata (חטא) literally meaning “to miss the mark,” or “to go astray.” In Judaism, kalahkah provides the “proper way” (or path) to live, whereas sin involves straying from that path. Turning from God’s Torah, from the way of the Lord (truth, justice, righteousness, and holiness). Judaism teaches that man is born with free will, and morally neutral, meaning that he is born with both the Yetzer Ha’tov (the good inclination) and the Yetzer Ha’ra (the evil inclination). This means that one is born with the tendencies to do either good or evil (e.g. selfishness). The first mention of sin as a noun in the Torah, is when the Lord told Cain that sin is crouching at the door according to Bereshit / Genesis 4:7. The first mention of sin as a verb in the Torah is with Abimelech being prevented from sinning (khata) against God in a dream. The entire Tanakh contains references to the sins committed by the people of God. This is to teach us that nobody is perfect. We do our best to learn from our mistakes, and we seek the Lord God in heaven and His Messiah Yeshua to help us to turn toward or return to the path of righteousness, truth, and justice. According to Bereshit / Genesis 4:7, the Lord suggests that it is possible to choose good over evil, it is possible to master, or overcome the Yetzer Hara. Judaism uses the term “sin” to include violations of the Torah that does not necessarily involve a lapse in morality. The Jewish Encyclopedia states, “Man is responsible for sin because he is endowed with free will (“behirah”); yet he is by nature frail, and the tendency of the mind is to evil: “For the imagination of man’s heart is evil from his youth” (Gen. viii. 21; Yoma 20a; Sanh. 105a). Therefore God in His mercy allowed people to repent and be forgiven.” Judaism holds that all people sin at certain points in their lives and that the Lord God in heaven tempers His justice with His mercy. We serve a merciful God, and what a joyful thing it is to serve a loving, forgiving, and merciful God. According to Parshiot Vayikra and Tzav, when the Temple yet stood in Jerusalem, the terms of the covenant called for the Korbanot (sacrifices) to be brought for one’s misdeeds. The atoning aspect of the korbanot is carefully written in the Torah, where we are told that the karbanot only expiate unintentional sins, that is, sins committed because a person who forgot that these things were sin or something that was done in error. In addition, there is no atonement for a malicious, deliberate sin. The karbanot have no expiating effect unless the person making the offering sincerely repents of his or her actions before making the offering, and makes restitution to any person who was harmed by the violation. This is why Yeshua taught in Matthew 5:23 ‘Therefore if you are presenting your offering at the altar, and there remember that your brother has something against you, 5:24 leave your offering there before the altar and go; first be reconciled to your brother, and then come and present your offering. (NASB) The reason being, what good is the offering if the person bringing the offering is unrepentant in both heart and in deed? Rabban Gamliel the son of Rabbi Yehudah HaNasi said: Excellent is the study of the Torah together with a worldly occupation, For the exertion [expended] in both of them causes sin to be forgotten. And all [study of the] Torah in the absence of a worldly occupation comes to nothing in the end and leads to sin. And all who work for the community, let them work for the [sake of the] name of Heaven, For the merit of the [community’s] ancestors sustains them, And their [ancestors’] righteousness will endure forever. And as for you [who work for the community], [God says:] I credit you with a great reward, as if you [yourselves] had [actually] done [everything on your own]. David continues in His Psalm saying, ו נוֹרָאוֹת | בְּצֶדֶק תַּעֲנֵנוּ אֱלֹהֵי יִשְׁעֵנוּ מִבְטָח כָּל-קַצְוֵי-אֶרֶץ וְיָם רְחֹקִים: ז מֵכִין הָרִים בְּכֹחוֹ נֶאְזָר בִּגְבוּרָה: ח מַשְׁבִּיחַ | שְׁאוֹן יַמִּים שְׁאוֹן גַּלֵּיהֶם וַהֲמוֹן לְאֻמִּים: 65:5 By awesome deeds You answer us in righteousness, O God of our salvation, You who are the trust of all the ends of the earth and of the farthest sea; 65:6 Who establishes the mountains by His strength, Being girded with might; 65:7 Who stills the roaring of the seas, The roaring of their waves, And the tumult of the peoples. (NASB) With our knowledge of Yeshua the Messiah, these words provide us with a messianic expectation of sorts. The Lord calms the seas, He causes the mighty waves to settle down, and the whole surface of the ocean becomes calm and smooth. The storm becomes silent at his command, and the sea is still. The reason these verses become a messianic expectation is because this reminds us of Yeshua when he calmed the sea in Mark 4:39. Yeshua demonstrated great power, to command the wind and the sea to be still. In Yeshua, we find the righteousness of God, He is our Salvation, and all the ends of the earth, from the farthest sea, trust in Him. What an amazing picture of the Messiah. A comparison may also be made to Tehillim / Psalms 107:29. We stagger in this life as we look to our Messiah for direction and guidance. In John 6:68, Peter said, 6:68 Simon Peter answered Him, ‘Lord, to whom shall we go? You have words of eternal life. (NASB) He answered for all of the disciples saying, Κύριε … ζωῆς (Kurie … Zones), meaning Lord, you are life, the absolute fullness of life, both essential and ethical, real and genuine, and devoted to God (definition of ζωῆς from Thayer’s Greek Lexicon). Peter then gives three reasons why the disciples remain faithful while the others left in John 6, (i) πρὸς τίνα ἀπελευσόμεθα; “To whom shall we go away?” implying that they must attach themselves to some one as a rabbi or teacher to instruct them. Peter couldn’t imagine that anyone else could be to them what Yeshua has been thus far. (ii) They are bound to Him because He has words of eternal life, ῥήματα ζωῆς αἰωνίου ἔχεις. They have experienced that His words were spirit, truth, and life (John 6:63). Yeshua was teaching Torah and how to live a life that was pleasing to the Lord. They recognize the newness of life that is found within Yeshua’s words which proceed from the Father in heaven. Yeshua taught them how to more appropriately keep the Torah (the mitzvot) and how to live life with a love for God and others, even a love for their enemies. They recognized the life that is found within His words. (iii) Peter said καὶ ἡμεῖς (John 6:69), “we for our part,” no matter what others think, πεπιστεύκαμεν καὶ ἐγνώκαμεν “have believed and know,” and 1 John 4:16, ἡμεῖς ἐγνώκαμεν καὶ πεπιστεύκαμεν, which is the Greek expression of conviction, “we have believed and we know by experience” ὅτι σὺ εἶ … ὁ ἅγιος τοῦ Θεοῦ see Mark 1:24, Luke 6:34, Acts 3:14, 4:27, 4:30, and Revelation 3:7. The disciples saw the works of the Messiah, and they stood back in fear and trembling, wondering what manner of man he was. (Mark 4:41) The disciples saw and experienced the power of God, and the truth of His holy word, and there was nobody else who could possibly be turned to for guidance besides the Messiah of God (Yeshua). In a similar manner, we stand in awe of God’s power, ט וַיִּירְאוּ | יֹשְׁבֵי קְצָוֹת מֵאוֹתֹתֶיךָ מוֹצָאֵי-בֹקֶר וָעֶרֶב תַּרְנִין: י פָּקַדְתָּ הָאָרֶץ | וַתְּשֹׁקְקֶהָ רַבַּת תַּעְשְׁרֶנָּה פֶּלֶג אֱלֹהִים מָלֵא מָיִם תָּכִין דְּגָנָם כִּי-כֵן תְּכִינֶהָ: 65:8 They who dwell in the ends of the earth stand in awe of Your signs; You make the dawn and the sunset shout for joy. 65:9 You visit the earth and cause it to overflow; You greatly enrich it; The stream of God is full of water; You prepare their grain, for thus You prepare the earth. (NASB) What is the stream of God? The stream is described as full of water. One possibility for the “Stream of God” is with regard to a stream of tradition, or halachah. Classical Judaism views God as a personal God. This concept is developed from the Scriptures where we find anthropomorphic statements about God which are understood to be linguistic metaphors that enable us to understand and otherwise would make it impossible for us to talk about out Father in heaven at all. An alternate interpretation on stream of God with regard to the “stream of tradition” is given by Maimonides, who rejected the idea of a personal God. (Maimonides, The Guide of the Perplexed, translated by Chaim Menachem Rabin, Hackett, 1995) The stream of God that David may be referencing is that of the Torah, it is the way to live a full life in righteousness, holiness, truth, and justice. I prefer to interpret this verse to say that the stream of God is the Torah, and this was David’s attitude towards the Torah that is given in His Psalms. If the Torah is not written on the heart, then it is only an obligation, a set of rules that one must live by and are therefore a burden. However, when the Torah is written on the heart (see Jeremiah 31), the person then keeps the Torah with love, joy and gladness. In addition to these things, The Torah is known as mayim chayim, “waters of life,” according to Judaism. The reason all of these things are true, is by reason that all the inhabitants of the world stand in awe of him, because of the works of His hands, the world fears in awe of the Almighty God who manifests His works in creation. The fear of God is often expressed as worship, therefore the world worships Him for His mighty works. The fear of God is also connected to the keeping of the commandments, which is the duty of all men according to Solomon who said, “fear God, and keep his commandments, is the whole duty of man” (Ecclesiastes 12:1). David concludes his psalm saying, יא תְּלָמֶיהָ רַוֵּה נַחֵת גְּדוּדֶיהָ בִּרְבִיבִים תְּמֹגְגֶנָּה צִמְחָהּ תְּבָרֵךְ: יב עִטַּרְתָּ שְׁנַת טוֹבָתֶךָ וּמַעְגָּלֶיךָ יִרְעֲפוּן דָּשֶׁן: יג יִרְעֲפוּ נְאוֹת מִדְבָּר וְגִיל גְּבָעוֹת תַּחְגֹּרְנָה: יד לָבְשׁוּ כָרִים | הַצֹּאן וַעֲמָקִים יַעַטְפוּ-בָר יִתְרוֹעֲעוּ אַף-יָשִׁירוּ: 65:10 You water its furrows abundantly, You settle its ridges, You soften it with showers, You bless its growth. 65:11 You have crowned the year with Your bounty, And Your paths drip with fatness. 65:12 The pastures of the wilderness drip, And the hills gird themselves with rejoicing. 65:13 The meadows are clothed with flocks And the valleys are covered with grain; They shout for joy, yes, they sing. (NASB) Praising and worshiping the Lord is an important aspect of our fellowship with the Lord. We praise the Lord for His mercy, and for His Son Yeshua the Messiah. As David said, Your paths drip with fatness. 65:12 The pastures of the wilderness drip, And the hills gird themselves with rejoicing. 65:13 The meadows are clothed with flocks And the valleys are covered with grain; They shout for joy, yes, they sing. (NASB) We too shout for joy in the works of God’s hands, and praise Him for keeping us true to His Word. Let’s Pray! 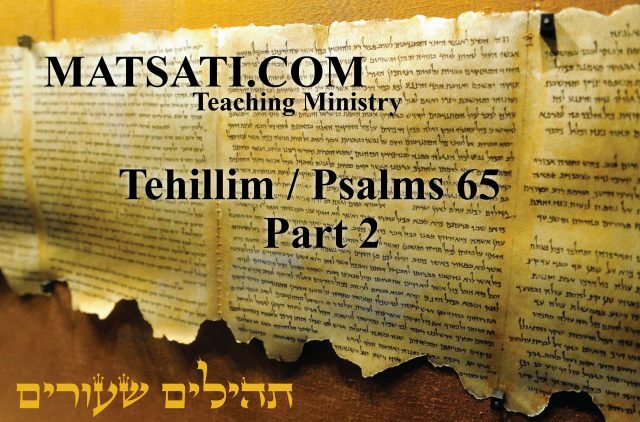 The Rabbinic Commentary (Midrash) on Tehillim / Psalms 65 has 4 parts. Reading through the Midrash we will be looking at Parts 1, 2, 3, and 4. Let’s begin by outlining Midrash Tehillim Chapter 65, Parts 1, 2, 3, and 4. Outline of Midrash Tehillim / Psalms, Chapter 65, Parts 1, 2, 3, and 4. The משל (mashal) “the parable,” goes on to explain the פתיחתא (Petihta), the rabbis comment upon David’s words speaking about the Temple being burned with fire and destroyed, an the sorrow they have as a result. The נמשל (Nimshal) “expansion on the parable” expands upon the משל (mashal), the rabbis expand upon the mashal by saying that God’s justice causes Him to remain silent due to the extent of sin Israel had committed. The משל (mashal) “the parable,” goes on to explain the פתיחתא (Petihta), the rabbis comment upon David’s words making a contrast between the heart of stone and the heart of flesh, that if a man makes his heart pliable, bendable like the flesh, the Lord will then hear his prayer. The נמשל (Nimshal) “expansion on the parable” expands upon the משל (mashal), the rabbis expand upon the mashal by discussing how the eyes and the ears may be filled so that one cannot hear, but the Lord does not have this difficulty. The משל (mashal) “the parable,” goes on to explain the פתיחתא (Petihta), the rabbis comment upon David’s words beginning with an interpretation on the meaning of David’s words, Blessed is the man whom You bring near to court, that David referred no to the court on high (in heaven). The נמשל (Nimshal) “expansion on the parable” expands upon the משל (mashal), the rabbis expand upon the mashal by comparing the court in heaven to God’s mercy, lovingkindness, and grace. The משל (mashal) “the parable,” goes on to explain the פתיחתא (Petihta), the rabbis comment upon David’s words discussing the reasons why prayer may or may not be answered. The concept is described as the gates of prayer, they may be open or shut, it depends. The prayer of repentance however is never shut. The נמשל (Nimshal) “expansion on the parable” expands upon the משל (mashal), the rabbis expand upon the mashal by saying there are acceptable times for prayer. Another interpretation was that the one who practices lovingkindness and righteousness will be heard. Silence is praise to You: Silence is praise to You; because there is no end to Your praise, the more one praises, the more one detracts. O God in Zion: God, Who dwells in Zion. Make glorious His praise: Not effusion, but silence is praise. It appears that דמיה means “praise God with awe,” with the expression “praise Ya-h.” The name consisting of two letters is translated (Exod. 15:2) as, the fear of God, for “My strength and my praise is God (י-ה).” Also (Exod. 17:16), “For a hand is on the throne of God (י-ה).” And the expression (above 2:11): “and rejoice with quaking” resembles this. To You is silence praise, O God, in Zion: That You were silent and still concerning Your enemies’ deeds in Zion is praise to You, for You are able to take revenge, yet You are slow to anger. Rashi appears to be contrasting the Hebrew word “domah” דומה meaning “like, alike, similar, resembling,” and “domiah” דומיה meaning “silence, quiet, stillness, hush, silentness.” He appears to separate the word דומיה as a composition of two words, דומ-יה, Dom meaning “silent” or דומה “who is like,” and Yah meaning “God.” Rashi translates this as “Praise God with awe.” His proof texts are taken from Shemot / Exodus 15:2 and 17:16. He says that silence is a form of giving praise to the Lord. Note how the Torah states that due to Israel’s sin, the land will enjoy its sabbath rests when it lays desolate (Vayikra / Leviticus 26:34-35, 2 Chronicles 36:21). The idea is that the silence of the land from sin due to those who live in the land is a form or worship. We to worship the Lord with both awe, rejoicing, quaking, and silence. The silence of the Lord in answering prayer, is also a form of praise to His name by reason that He is slow to anger and also able to take revenge upon the enemy. Midrash Tehillim 65, Part 1 concludes saying, “They have made a noise in the house of the Lord, as in the day of a solemn assembly (Lamentations 2:7). And what was the noise they made? They said, Our high hand and not the Lord has done all this (Devarim / Deuteronomy 32:27); and they also said, Where are their gods, their rock in whom they trusted? (Devarim / Deuteronomy 32:37) Hence, by the words, For You silence is praise, David meant, You are silent, and I will be silent, as is said Be silent to the Lord, and wait patiently for Him (Tehillim / Psalms 37:7).” David instructs in a previous Psalm to be silent, to rest patiently for the Lord, to cease from anger and do not seek wrath against those who do evil to you. Wrath and hatred only leads to evil deeds. Those who are wicked will be cut off soon enough. Those who live in sin will be cut off soon enough. Yeshua’s words in Matthew 7:1-8 may also be paralleled to our waiting upon the Lord to move in a man’s life to turn from sin. Of course we should warn our brothers and sisters if he or she is found living in sin. Condemnation however is not what we are about, let God’s Word speak as a testimony against those who live their lives in opposition to the Torah. The only true protection in this life is for those who wait patiently upon the Lord God in heaven. Midrash Tehillim 65, Part 2 opens with the Dibur Hamathil (דיבור המתחיל) saying “O You that hear prayer, unto You does all flesh come (Tehillim / Psalms 65:3).” The homiletic introduction to the midrash states, “Scripture does not say all men, but all flesh.” It is interesting how the rabbis describe those who come to the Lord and those whom the Lord hears. The Midrash takes the Scriptures from the Aramaic Targum as compared to the MT which states, Tehillim / Psalms 65:4 How blessed is the one whom You choose and bring near to You To dwell in Your courts. We will be satisfied with the goodness of Your house, Your holy temple. (NASB) Note the parallel of the goodness of God’s house, His holy temple, to hearing the prayer, and that all flesh come. There might be an inference here, to the body as a holy temple of the Lord. The rabbis suggest that one needs to make his heart yielding. What does it mean to make the heart yielding? It could be a reference to making our hearts gentle and not hard like stone. The idea of all flesh coming to the Lord is found within the context of the softening of the heart, which is again analogous being gentle, showing mercy, having kindness, etc. We cannot come boldly before the throne of God without these things in our hearts. Again, the Lord is not like us. He can hear all the prayers of men, as opposed to the mortal king who can only hear one man’s petition at a time. Note something here, the midrash speaks of making our hearts like flesh, and repentance. Our prayers are connected to our relationship with the Lord. We need to take our relationship serious. Due to our relationship with the Lord, understand that God is always teaching you. When life is suddenly full of problems or inconveniences, it may be time to stop and ask: “Why are these things happening to me? or Is the Lord trying to get my attention?” When the problems in life seem to be larger than minor inconveniences, for example, an auto accident or financial stress, then the Lord may be calling out to you on a different level. There may be something deep within yourself that needs to be rectified, and so your problems most likely have something to do with you. Take for example, if someone else is treating you badly, you may be saying in your heart, well my problems are not my fault, they are because of someone else. The reason another person may be treating your badly is because of what you have done in the past. The Lord may also be trying to work patience and compassion in your heart, something that is missing now, but will be developed through these difficult times. We ultimately do not know the major cause of our problems but we do know that the Lord God our Father in heaven is in control. Midrash Tehillim 65, Part 2 concludes saying, “Then God asked the children of Israel, Which sins are you praying to Me to forgive, unwitting sins, or willful sins? The children of Israel replied, We pray forgiveness not for unwitting sins alone, not for willful sins alone, nor for unknown sins alone. The tale of iniquities is too heavy for me; our transgressions, do You forgive them (Tehillim / Psalms 65:4).” The point here is that when we sin, sometimes they are unwillful, and most times a sin is willful. How do we distinguish between these and the Torah text that states there is only a sacrifice for unwitting sins? (Vayikra / Leviticus 1-5) The difference is that one is not planning sin, making plans to sin or to do evil to another person. Our hearts should be directed to doing good, serving God, and loving others. We should not be about the business of planning to sin. That is the interpretation of the Torah text, and Hebrews 10, that say there is no sacrifice or atonement for willful sin. ג אשרי תבחר ותקרב ישכון חצריך. אמר רב הושעיא בשם רב שמואל בר שילא משמיה דרב, אמר דוד רבונו של עולם אשרי למי שאתה מקרבו לחצר, ולא בחצר אלא במרום, מה יקר חסדך אלהים ובני אדם בצל כנפיך יחסיון ירויון מדשן ביתך (תהלים לו ח ט), גם בני קרח אמרו כי טוב יום בחצריך (שם תהלים פד יא), וכן הוא אומר אשרי יושבי ביתך (שם שם תהלים פ״ד ה). 3. Blessed is the man whom You choose and bring near, that he may dwell in Your courts (Tehillim / Psalms 65:5). Rabbi Hoshaia taught in the name of rabbi Samuel son of Shila who taught in the name of Rab, When David said, Master of the universe, Blessed is the man whom You bring near to court, he referred not to the court of the Temple, but to the court on high. This court he also referred to in the words How precious is Your loving kindness, O God. Therefore the children of men take refuge in the shadow of Your wings. They will be abundantly satisfied with the fatness of Your house (Tehillim / Psalms 36:9). To this the sons of Korah also referred in saying, For a day in Your courts is better than a thousand elsewhere (Tehillim / Psalms 84:11). And this is also referred to in the verse Blessed are they that dwell in Your house (Tehillim / Psalms 84:5). The rabbis say that when David says, 65:5 How happy the one you will choose and bring near; he will abide in Your courts. The righteous will say, “We will be satisfied in the goodness of your house, the holiness of your temple.” (EMC) the abiding in Your courts is a reference not to the earthly tabernacle or temple, but to the heavenly court. Studying the Scriptures for descriptions of the courts of God, the Tanach mentions God’s throne in the 1 Kings 22:19, Isaiah 6:1-4, Ezekiel 1:24-28, Daniel 7:2-10, and Zechariah 3:1-7. In each of these descriptions from the Tanach, we see the Lord sitting upon His throne. In Judaism, some philosophers such as Saʿadiah Gaon and Maimonides, interpret the mention of a “throne” as allegory. This however is not the general interpretation. The heavenly throne room is a description of the location of the heavenly court, the place where Satan debated with the Lord over Job in Job 1. Micaiah’s extended prophecy (1 Kings 22:19) is the first detailed depiction of a heavenly throne room in Judaism. Zechariah 3 describes a vision of the heavenly throne room, though the “throne” of God is not mentioned. In this vision, Satan and the Angel of the Lord contend over Joshua the High Priest in the time of his grandson Eliashib the High Priest. The Dead Sea Scrolls also has the concept of the heavenly throne. In the Apostolic Writings, the throne of God is discussed in several places. Matthew has Yeshua discussing the topic of the throne of God with regard to making an oath, Matthew 23:20 ‘Therefore, whoever swears by the altar, swears both by the altar and by everything on it. 23:21 ‘And whoever swears by the temple, swears both by the temple and by Him who dwells within it. 23:22 ‘And whoever swears by heaven, swears both by the throne of God and by Him who sits upon it. (NASB) The book of Revelation describes the Seven Spirits of God which surround the throne, and John states before the throne there appears to be a sea of glass clear as crystal. In addition, he says, the throne is surrounded by a lion, an ox, a man, and a flying eagle; each with six wings and covered with eyes, who constantly repeat “Holy, holy, holy is the Lord God Almighty, who was, and is, and is to come.” It is also said that “out of the throne proceeded lightnings and thunderings and voices.” (Revelation 4) The Apostolic Writings continues the Jewish identification of heaven as the place of the throne of God. The power of the Rabbis is threefold: (i) to amplify the Torah either by prohibitory statutes for the prevention of transgressions (“gezerot”) or by mandatory statutes for the improvement of the moral or religious life of the people (“takkanah”). They also have introduced new rites and customs (“minhagim”, מנהג). (ii) to expound the Law according to certain rules of hermeneutics, and thereby evolve new statutes as implied in the letter of the Law; and, (iii) to impart additional instruction based upon tradition. The midrash states that David was speaking of drawing near to the Lord, to the heavenly court. Midrash Tehillim 65, Part 3 concludes saying, “To this the sons of Korah also referred in saying, For a day in Your courts is better than a thousand elsewhere (Tehillim / Psalms 84:11). And this is also referred to in the verse Blessed are they that dwell in Your house (Tehillim / Psalms 84:5).” The idea is that a man is blessed when the Lord allows him to enter into His courts. We thank Yeshua the Messiah for enabling us to enter into the courts of God and having access to His throne. Blessed indeed is the man to whom the Lord hears his prayers in the name of Yeshua the Messiah, in the name of God’s Salvation! Midrash Tehillim 65, Part 4 opens with the Dibur Hamathil (דיבור המתחיל) saying “With wondrous works do You answer us in righteousness, O God of our salvation; You the confidence of all the ends of the earth, and of the sea, afar off (Tehillim / Psalms 65:6).” The homiletic introduction to the midrash states, “With regard to this verse, rabbi Hanina son of Papa asked rabbi Samuel son of Nahmani, What is meant by the words You have covered Yourself with a cloud, so that no prayer can pass through (Lamentations 3:44)?” What is meant by the words You have covered Yourself with a cloud so that no prayer can pass through? The rabbis reference Lamentations 3:44. Solomon is speaking of the people seeking the Lord, and because of their sins it appears the Lord does not hear their prayer which is described as the Lord covering Himself with a cloud so that no prayer can pass through. He describes the situation by drawing a parallel to Israel as a dung heap and the cloud as a covering so the Lord does not see or smell the stench of dung. These words of Solomon paint us a picture of what David says in Tehillim / Psalms 141:2 May my prayer be counted as incense before You; The lifting up of my hands as the evening offering. (NASB) and Revelation 8:4 And the smoke of the incense, with the prayers of the saints, went up before God out of the angel’s hand. (NASB) Our prayer goes before the Lord as a fragrant and sweet smell before the Lord. If we hold things in our heart, darkness, sin, hatred, etc, these things are considered as dung and produce an awful stench in our prayer life. The reason is we take these things and pray selfishly for the detriment of others rather than for the help and peace between brothers, enemies, man and God. Lamentations 3:44 states, מד סַכּוֹתָה בֶעָנָן לָךְ מֵעֲבוֹר תְּפִלָּה: 3:44 You have covered Yourself with a cloud So that no prayer can pass through. (NASB) Breaking down the sentence, the idea here is סַכּוֹתָה meaning “to entwine as a screen; by implication, to fence in, cover over, (figuratively) protect or cover, defense, defend, hedge in, join together, set, shut up,” בֶעָנָן meaning “a cloud (as covering the sky), e.g. the nimbus or thunder-cloud or cloud,” מֵעֲבוֹר meaning “to cross over; used very widely of any transition (literal or figurative; transitive, intransitive, intensive, causative),” and תְּפִלָּה meaning “intercession, supplication; by implication, a hymn, prayer.” The idea here is the Lord covers Himself because of our sins. If our prayers proceed from the heart, we should ask the Lord first according to Tehillim / Psalms 51:10 Create in me a clean heart, O God, And renew a steadfast spirit within me. (NASB) and then please let me bring my petition before You Oh Lord. The rabbis believe there are times when the gates of prayer are open and other times when the gates of prayer are shut. This is like the cloud that covers the Lord so He does not hear us by reason of our sin, or the that He does not answer our prayers for some other reason. The midrash states that the gates of repentance however are never closed. The gate analogy offers us an interesting way of viewing repentance. Take for example, the gate as something that would bar entrance to a house or a court. We read of the gates of heaven in Revelation 21:21. The book of Revelation speaks of the gates of heaven and the nations, peoples, and kings walking through these gates, and these gates never closing. When the rabbis speak of the gates of repentance never closing, this includes both that of prayer, and of walking through, righteous deeds, those deeds meet for repentance. The deeds that are done to show a repentant heart, is what John said in Matthew 3:7-12. This is the same reasoning that Yeshua used when he said in Matthew 5:22 ‘But I say to you that everyone who is angry with his brother shall be guilty before the court; and whoever says to his brother, ‘You good-for-nothing,’ shall be guilty before the supreme court; and whoever says, ‘You fool,’ shall be guilty enough to go into the fiery hell. 5:23 ‘Therefore if you are presenting your offering at the altar, and there remember that your brother has something against you, 5:24 leave your offering there before the altar and go; first be reconciled to your brother, and then come and present your offering. 5:25 ‘Make friends quickly with your opponent at law while you are with him on the way, so that your opponent may not hand you over to the judge, and the judge to the officer, and you be thrown into prison. (NASB) The man who was repentant brought a sacrifice in fulfillment of the command to do so according to the requirements of the covenant. Repentance included both a heart felt sorrow, prayer seeking forgiveness, action to make right the wrong, and to turn from sin towards God’s ways by ceasing to sin and making right what was wrong. Notice how the rabbis say these same things in the midrash, the words, You the confidence of all the ends of the earth, and of the sea, afar off, mean that repentance is like the sea which is never barred, so that whoever desires to bathe in it, bathes in it whenever he desires; whenever a man desires to repent, the Holy One blessed be He, receives him. For prayer, however, there are set times. The bathing is a reference to the mikvah and consequently to one returning to fellowship with God, and with the covenant community. The rabbis are making a distinction between repentance and prayer suggesting that repentance, which includes all of these things, a man is never barred from doing. Prayer on the other hand has set times. This concept is expounded upon by Rabbi Jose son of Halafta who said, in the words But as for me, let my prayer be unto You, O Lord, in an acceptable time (Tehillim / Psalms 69:14), an acceptable time shows that there are set times for prayer. The question is what is the acceptable time that David is speaking of? The midrash states, חד מנהון אמר מי שהוא גומל חסדים יהא מבושר שתהא תפלתו נשמעת, שנאמר זרעו לכם לצדקה [וגו׳] (הושע י יב) One of them maintained, He who practices lovingkindness (גומל חסדים) may feel assured that his prayer will be heard, for it is said, Sow to yourselves in righteousness, reap in lovingkindness (Hosea 10:12). Note how they say, the one who practices chasidim (חסדים), mercies, graces, lovingkindness, may be assured that his prayer will be heard. This follows with John’s statements in Matthew 3, and Yeshua’s statements in Matthew 5. The rabbis continue saying And what does the verse go on to say? That is the time to seek the Lord, meaning that when such a man prayers to the Holy One blessed be He, he is heard, suggesting that a man should seek the Lord in prayer from a repentant heart. This is the manner in which David acted throughout his life, humble and repentant, and stands as an example for us as well to live humble and repentant lives before the Lord. Midrash Tehillim 65, Part 4 concludes saying, “And the other said, I do not set aside the words of my Master, but from Scripture I merely add another proof to his comment, for directly after the verse, O God, because of the abundance of Your lovingkindness (Tehillim / Psalms 69:14), there follows, Hear me in the truth of Your salvation (Tehillim / Psalms 69:14).” The rabbis conclude saying that the Lord is abundant (בְּרָב) in grace (יד וַאֲנִי תְפִלָּתִי-לְךָ | יְהֹוָה עֵת רָצוֹן אֱלֹהִים בְּרָב-חַסְדֶּךָ עֲנֵנִי בֶּאֱמֶת יִשְׁעֶךָ:) and that He hears us in the truth (בֶּאֱמֶת) of His salvation (יִשְׁעֶךָ). Taking all of these things we have been learning regarding what the rabbis are saying about prayer, heaven, and the courts of God, notice what Yeshua says regarding prayer in John 14:11-18. Yeshua speaks of being one with the father, of doing the works that he did, of believing in him and in our Father in heaven, of praying in His name (Yeshua) , of praying in the name of God’s Salvation, and that the Lord will hear our prayers. Does this not sound very similar to this week’s midrash? Yeshua promises to never leave us, that he will come to us, he will send a helper, the Holy Spirit of God, to dwell inside of us, etc. Yeshua provides a great hope and expectation that the Lord will move in our lives. Note also that his statement in John 14:15 to keep the commandments, corresponds to living a repentant life, and bringing our lives humbly in line with God’s Word. Let’s Pray! Parashat Bo, Are you beginning to resemble what you are worshiping?